Jett and the Blackhearts can still rock out, but do so in frustratingly short bursts on new CD. Oh, Joan Jett. Mistress of early 1980s badass rock. Progenitor of riot grrrl. Loved by boys for her tough looks, and girls for her tough music (and by gay boys like myself on general principal). It's been a long time since "I Love Rock N' Roll". Hell, it's been a long time since her run of coolness during the early 1990s. In recent years, you could have found her gigging around the country, playing festivals (true story: I was on a flight with her and her band after they performed at the Celebrate Americafest in De Pere, Wisconsin -- that's a suburb of Green Bay for non-cheeseheads). Yet she soldiers on. In part because she probably likes it; in part because she probably doesn't know what else to do with her time. And, most likely, because she wants to show Joanie-come-latelys like the Donnas how the big girls play. And after the first song on Sinner, I was ready to toss this collection aside into the "artists who issue albums to have some reason to stay on the road" pile. "Riddles" is dull, dull, dull, lacking any of the spark that Jett brought to the table in her music with the Runaways or the early days of the Blackhearts. Then I got to track two. "AC/DC" -- a love song about choosing between a boyfriend and a girlfriend -- pummels you with a classic Jett riff, followed by her signature tough-as-nails vocals, and then into a driving, catchy chorus. It took a bit, but Jett is back. 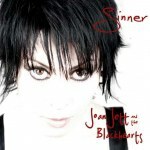 I doubt Sinner will burn up the charts, but that really isn't the point with an artist like Jett. She and the Blackhearts have reached the point in their careers that it really is just about making music. That some of it is great is a fine testament to the talent Jett always had, but was often ignored behind her tough-woman exterior. That some of it is not-so-great makes you happy for an era where snipping a song off a record is as easy as pressing the delete key on your keyboard. In fact, I think I'll go do some pressing right now.